Many drinks at convenience stores and supermarkets claim to give you energy, such as Red Bull®, Full Throttle®, Monster®, Rockstar®, Five Hour Energy® and others. You may be wondering if these drinks actually give you energy, and if they’re healthy to drink. Read on to learn about the ingredients in energy drinks so you can make smart choices. The amount of sugar in energy drinks is about the same amount as soda. This sugar might give you a burst of energy (on top of the caffeine), but when it wears off, you may have a sugar “crash” and become tired all over again. While it’s ok to have sugar–containing foods and drinks once in a while, eating or drinking too much sugar can cause cavities and weight gain and it is not a sustainable form of energy. Energy drinks can also cause allergic reactions or interactions with prescription medications. Why are herbs added to energy drinks? The manufacturers of energy drinks claim that added herbs such as ginseng, guarana (gwahr–uh–nah), yerba mate (yer–bah mah–te), cocoa, kola nut, or yohimbine help to boost the energizing quality of their beverages. The problem with taking herbs or other supplements either in pills or in energy drinks is that they’re not regulated by the US Food and Drug Administration (FDA). As a result, there’s no guarantee that the herbs are actually what they say they are, or that they do what they claim. Herbs such as ginseng, guarana, or yohimbine can even have harmful side effects such as elevated (fast) heart rate, headache, or insomnia. Are the vitamins and amino acids in energy drinks good for me? Many vitamins and minerals are added to energy drinks. If you’re eating a well–balanced diet, you’re probably already getting enough vitamins and minerals for your body. However, if your diet is not quite “balanced,” a multivitamin supplement is a much safer way to get in your extra vitamins, without the extra calories, sugar, herbs, and caffeine. 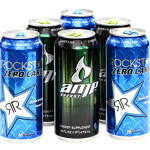 Energy drinks are also known for their additional ingredients such as added amino acids or other substances. You might see them listed on a label as taurine (tawr–in), glutamine (gloo–tuh–meen), arginine (ahr–juh–neen), and L–carnitine. While amino acids are needed by the body to serve as the building blocks of protein, if you’re eating a well–balanced diet, you don’t need these additional amino acids. Are energy drinks recommended for teens? No. Energy drinks usually contain some mix of caffeine, added substances that act like stimulants, and excess sugar. Energy drinks are often marketed to teens with claims that they boost energy, decrease fatigue, and increase concentration. These claims mislead many teens and adults into thinking energy drinks are beneficials for attention and sports performance. Don’t be fooled by these marketing claims! These drinks are unhealthy for teens and the consumption of large amounts of caffeine have led to thousands of emergency room visits and even in a few extreme cases, death. Scientific studies have shown that they can affect heart health, sleep, and weight. In fact, the American Academy of Pediatrics and the American Medical Association recommends that children and teens avoid them. Some lawmakers are even attempting to ban the marketing and sale of energy drinks to children and teens. What can happen if I have too much caffeine? Caffeine may be the most commonly consumed stimulant, but excess consumption has been associated with harmful effects in teens. If you have too much caffeine, you may experience side effects such as jitteriness, dizziness, nervousness, insomnia (trouble sleeping), vomiting, and upset stomach. When you have caffeine regularly, your body can build up a tolerance to (get used to) caffeine. This means you’ll need more caffeine to have the same stimulant effect. Also, when you stop drinking caffeine you may get headaches and become cranky or tired for a few days. It can be hard to know how much caffeine you are consuming because there is no requirement for companies to state the amount of caffeine in a beverage. Should I use energy drinks while I’m exercising? No. Energy drinks should be avoided before, during, and after exercise. The caffeine and sugar in energy drinks can actually make you more dehydrated. What’s the difference between sports drinks and energy drinks? Sports drinks are different from energy drinks. Sports drinks include carbohydrates, electrolytes, and often vitamins and minerals. They’re made for rehydration during and after intensity physical activity to replace nutrients lost when you sweat. Sports drinks only need to be utilized after long periods of endurance activities – in most instances water is the best choice to refuel with during and after being physically active. Is it safe to combine energy drinks with alcohol? No. Combining energy drinks with alcohol can be dangerous. Alcohol is a depressant, while the energy drink is a stimulant. When you have the two together, you may not realize how much alcohol you drank and how impaired you really are. Dehydration may also be worse because you’ll have to urinate more often due to the combined effect of the alcohol and caffeine in the energy drink. So what’s the bottom line with energy drinks? Skip them. While energy drinks may give you a rush of energy when you first drink them, in the long run, they usually end up making you more tired and may result in harmful effects such as heart palpitations, dizziness, and even seizures. There are plenty of other beverages to enjoy. If you feel that you need some instant energy, try having a piece of fruit and a glass of water; you may be surprised that the effects are similar! You can increase your energy without expensive and potentially dangerous energy drinks. Eating well–balanced meals, drinking plenty of fluids, getting adequate amounts of sleep, and exercising regularly are all great ways to help you to feel energized throughout the day.